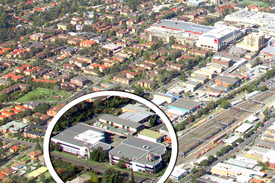 7 Commercial Real Estate & Properties in Hornsby are listed in 2 categories. We have 6 OfficesLease and 1 Retail ShopsLease . Regular Cleaning | Central Location | Dedicated Receptionist $589pw | 4 Person Workspa..
PROPERTY OVERVIEW $589pw Price incl. Fantastic serviced office space in Hornsby. Price incl. Rent, Electricity, Building Outgoings & All Utility Bills Fully furnished & private Flexi terms Economical option Regular Cleaning 24/7 access Avail NOW for long or short term rent This modern and quality workspace is located in Hornsby, only 750 meters from Hornsby train station and bus interchange, providing easy access for both you and your clients. The building offers air conditioning, a dedicated receptionist and support team and an abundance of natural light to make sure your days are bright and productive. This is the perfect opportunity for any business seeking an affordable office solution. The advertised office space is perfect for a team of 4. If you need more or less space, we have over 30,000 furnished workspaces all over the world suitable for a team of 1 to 200+. Our award winning team offer a free service that will help you find the perfect solution for your needs, so reach out if you need more help. What you get for your weekly rent Furnished office with desks, chairs and lock up storage units Complimentary receptionist to meet and greet your clients Unlimited commercial grade internet service Electricity usage included Regular cleaning Telephone number & handset Prestigious business address to put on your cards Flexible terms from 1 month 2 years Ability to bring your existing phone number over 24 x 7 access to your office 24 x 7 security Office features Modern facilities Full mail management and postage Large boardroom and meeting room for use Signage board in foyer to highlight your business name Quality finishes and amenities throughout Professional environment Server / Comms rooms available for server storage Building features Central Location Car parking in building and surrounding areas Dedicated on site management team 1min walk to bus stop 500m to Westfield shopping centre 8min walk to Hornsby train station 20kms to Sydney CBD 30min drive to Sydney Airport WHO IS OFFICE HUB? Office Hub is Australia & New Zealand\'s No 1 small office space commercial real estate agency. We have the largest collection of shared spaces, coworking and serviced offices in Australia & New Zealand, perfect for 1 100 employees. Let us take you on a tour of all the spaces that fit your needs and budget. Our service is complimentary and we work for you and the landlord to negotiate the most competitive deal in the market. Let us show you how shared and serviced offices can be the perfect solution for your business. www.office hub.com.au www.office hub.co.nz Conditions apply A portion of the square meterage factors in access to shared space. Price includes any incentives offered. This is for new tenants only. Bright, Open Plan First Floor Office UNDER OFFER - Call Anthon.. Neatly presented, fully fitted and ready to go! Floor to ceiling windows fronting Bridge Road provides this open plan office with plenty of natural sunlight. Minutes from Westfield Shopping Centre and Hornsby Railway Station. Spacious and practical work space approx 333 sqm Fully self contained with own amenities Signage possibilities Abundant car parking available For further information please contact Anthony Parisi 0415 902 329 or Ivor Zhou 0430 248 867 Disclaimer: All data is provided for information purposes only and while all care is taken in its presentation Shead Property does not guarantee or warrant the accuracy, completeness or currency of the information. 238sqm Office For Lease - $1,000 Per Week Gross Ex Gst Call Anthony Parisi 0415 ..
Just a short walk from Hornsby Train Station and Westfield Hornsby, this first floor office provides an affordable office opportunity for an expanding, contracting or new business. The property consists of 238sqm with partitioned offices, open plan space, 2 bathrooms, a shower, dry kitchenette and 2 car spaces. Great Natural Light Partioned offices, Meeting Rooms and Open Plan Space 238 sqm with 2 car spaces Close Proximity to Hornsby Train Station and Westfield Hornsby For further information please contact Anthony Parisi 0415 902 329 or Ivor Zhou 0430 248 867 Disclaimer: All data is provided for information purposes only and while all care is taken in its presentation Shead Property does not guarantee or warrant the accuracy, completeness or currency of the information. Central Location | Regular Cleaning | Modern Facilities $649pw | 4 Person Workspa..
PROPERTY OVERVIEW $649pw Price incl. 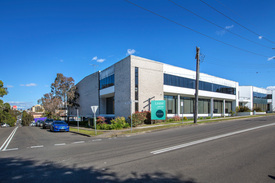 Fantastic serviced office space in Hornsby. Price incl. Rent, Electricity, Building Outgoings & All Utility Bills Fully furnished & private Flexi terms Economical option Regular Cleaning 24/7 access Avail NOW for long or short term rent This modern and quality workspace is located in Hornsby, only 750 meters from Hornsby train station and bus interchange, providing easy access for both you and your clients. The building offers air conditioning, a dedicated receptionist and support team and an abundance of natural light to make sure your days are bright and productive. This is the perfect opportunity for any business seeking an affordable office solution. The advertised office space is perfect for a team of 4. If you need more or less space, we have over 30,000 furnished workspaces all over the world suitable for a team of 1 to 200+. Our award winning team offer a free service that will help you find the perfect solution for your needs, so reach out if you need more help. What you get for your weekly rent Furnished office with desks, chairs and lock up storage units Complimentary receptionist to meet and greet your clients Unlimited commercial grade internet service Electricity usage included Regular cleaning Telephone number & handset Prestigious business address to put on your cards Flexible terms from 1 month 2 years Ability to bring your existing phone number over 24 x 7 access to your office 24 x 7 security Office features Modern facilities Full mail management and postage Large boardroom and meeting room for use Signage board in foyer to highlight your business name Quality finishes and amenities throughout Professional environment Server / Comms rooms available for server storage Building features Central Location Car parking in building and surrounding areas Dedicated on site management team 1min walk to bus stop 500m to Westfield shopping centre 8min walk to Hornsby train station 20kms to Sydney CBD 30min drive to Sydney Airport WHO IS OFFICE HUB? Office Hub is Australia & New Zealand\'s No 1 small office space commercial real estate agency. We have the largest collection of shared spaces, coworking and serviced offices in Australia & New Zealand, perfect for 1 100 employees. Let us take you on a tour of all the spaces that fit your needs and budget. Our service is complimentary and we work for you and the landlord to negotiate the most competitive deal in the market. Let us show you how shared and serviced offices can be the perfect solution for your business. www.office hub.com.au www.office hub.co.nz Conditions apply A portion of the square meterage factors in access to shared space. Price includes any incentives offered. This is for new tenants only. A prime positioned professional office located on the corner of Edgeworth David Avenue & Romsey Street in Hornsby. Features: + Large open plan space + Fully Air Conditioned + Suitable for a variety of uses including medical or professional offices + Inspect by appointment and Price on Application + Parking available Short walking distance to Westfield Shopping Centre and Hornsby Train Station Call Eamonn 0421 037 758 for more information. Potential Cafe/Restaurant opportunity (STCA). Becoming available early January 2017, this space is a great opportunity for a new eatery in the Hornsby precinct. Flexible workspace 240 sqm approx Fully self contained Abundant car parking. For any further details, please do not hesitate to contact Jacob Broxom 0422 194 532 or Bill Geroulis 0413 100 200. Disclaimer: All data is provided for information purposes only and while all care is taken in its presentation Shead Property does not guarantee or warrant the accuracy, completeness or currency of the information. This spacious site is conveniently located minutes from Westfield shopping Centre and Hornsby Railway Station. The building corners Bridge Road and Hunter Street and offers excellent exposure with signage potential and abundant car parking. Area 666 sqm approx Signage potential Convenient location Contact Jacob Broxom 0422 194 532 or Bill Geroulis 0413 100 200 Disclaimer: All data is provided for information purposes only and while all care is taken in its presentation Shead Property does not guarantee or warrant the accuracy, completeness or currency of the information.